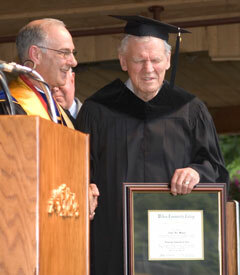 Remarks by Dr. Gordon Burns, President of Wilkes Community College, at the 2005 presentation of an Honorary Associate in Arts degree to Doc Watson. As we celebrate the special 40th anniversary year, we want to recognize truly notable achievement through the awarding of our first ever honorary degree. The recipient is our own “Doc” Watson, a native son, who is a highly accomplished and acclaimed musician. HIS accomplishments include multiple Grammy Awards, a 2004 Grammy Lifetime Achievement Award, a National Medal of the Arts, the induction into the International Bluegrass Music Association (IBMA) Hall of Honor, as well as numerous state and local recognitions. Beyond these achievements, it is appropriate that Doc be recognized for his contributions to Wilkes Community College. Doc’s contributions to the college, the community and the region are incomparable. He has drawn positive attention to the region’s musical heritage and, in doing so, has contributed to the economic well-being of the region. During the past nine years, MerleFest has exerted a cumulative $90.8 million economic impact on the region. The past four MerleFests alone have permitted campus and civic non-profit groups to net more than $1.2 million in income. Cumulatively, Merlefest in its 18 years has contributed more than $5 million to Wilkes Community College. Beyond the scope of the economic impact, the festival has fostered a spirit of community and volunteerism that is unsurpassed. Doc Watson, and what he represents, serve as an inspiration to us all. It is fitting that Doc Watson be recognized and honored for both his accomplishments and his contributions. With great admiration and appreciation, it gives me great pleasure to award Arthel “Doc” Watson the first Wilkes Community College Honorary Associate in Arts degree. Dr. Gordon Burns presents honorary degree to Doc Watson. Photo courtesy of Wilkes Community College.